Last week’s blog focused on barriers to engaging board members to participate in fundraising. This week, we will concentrate on how some CDFIs achieve board participation in fundraising activities and how the CDFI industry might be lagging behind a bit with respect to other nonprofit organizations. In the nonprofit industry, one of the most common methods of engaging board members in fundraising is by requiring them to donate a specified amount to the organization. The 2012 Non-Profit Research Collaborative Survey showed that 57 percent of nonprofit respondents required board member contributions. However, in FUND’s recent survey, only 40% of CDFIs reported requiring a “give or get policy”. Staff and board have agreed upon fundraising goals and targets. When asked if board members have specific fundraising goals, only 17.6 percent of respondents indicated that they create agreed upon performance goals with board members. Of these, 37.5 percent create customized goals for each board member. Goals may include monetary targets, facilitating a specified number of introductions, or sharing contact lists. Does your organization have specific policies on board giving? Are they goals specified in a formal fundraising plan? 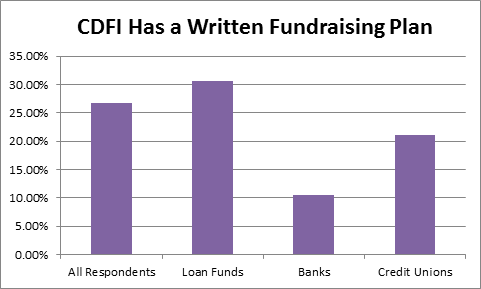 Next week we will present data on how much money CDFI boards are raising for their organizations. CDFI Boards and Fundraising, Week 5: Barriers to Fundraising	CDFI Boards and Fundraising, Week 7: How Much Money do CDFI Boards Raise?